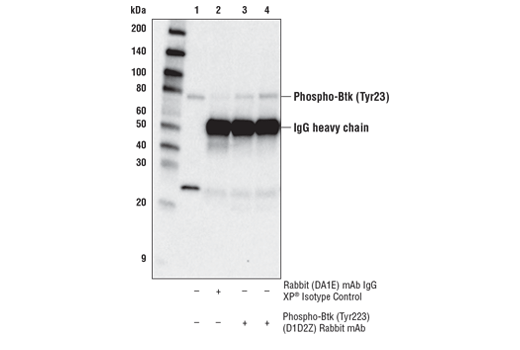 Phospho-Btk (Tyr223) (D1D2Z) Rabbit mAb recognizes endogenous levels of Btk protein only when phosphorylated at Tyr223. The antibody detects a 26 kDa protein of unknown identity that is not sensitive to treatment with anti-IgM or Ibrutinib. 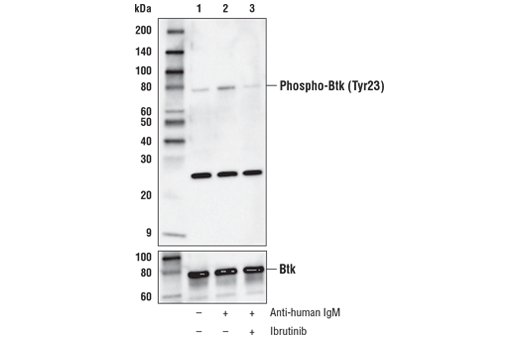 Monoclonal antibody is produced by immunizing animals with a synthetic phosphopeptide corresponding to residues surrounding Tyr223 of human Btk protein.